It’s Spring Break, which means fun in the sun, splashing in the water, and chilling by the pool. Dig in the sand, play with your kids, and forget about life’s responsibilities. It’s ultimate relaxation time! 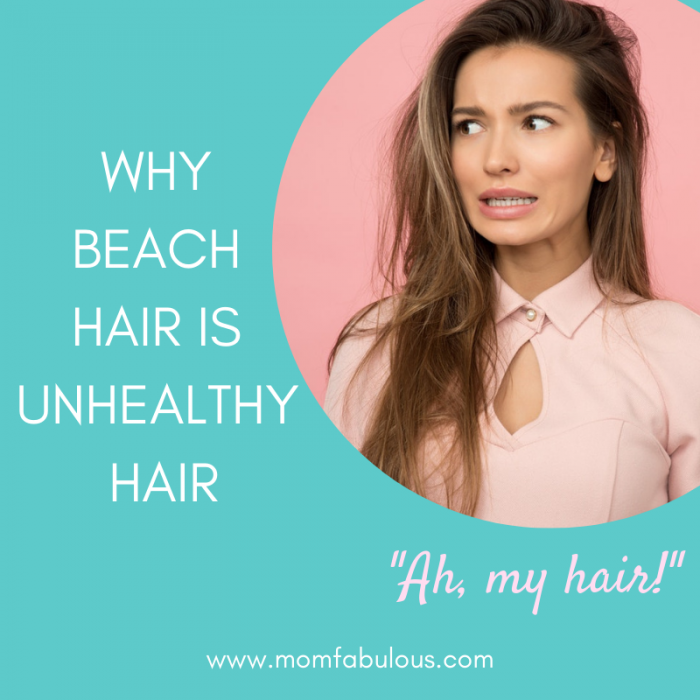 However, you don’t want to look in the mirror mid-trip and scream, “Ah, my hair!” Perhaps you have the perfect beachy waves from the salty ocean water, or maybe you have amazing volume from the wind. In reality, you more than likely have damaged hair that doesn’t look beautiful. 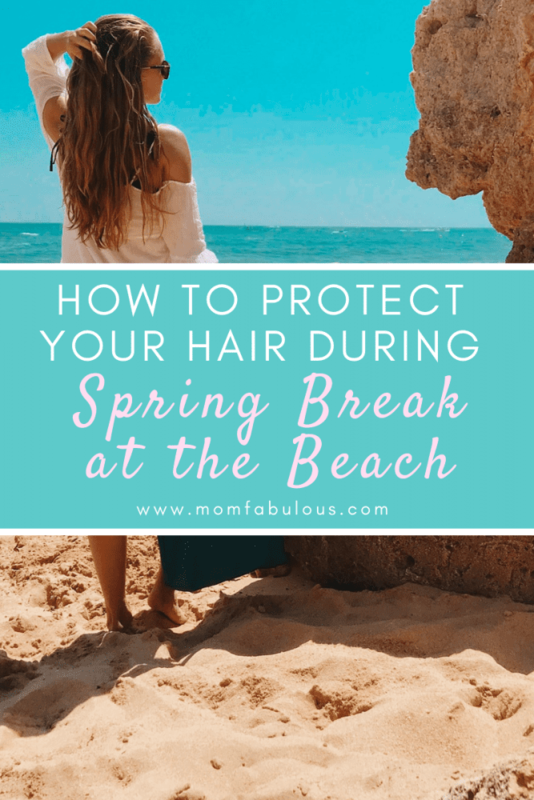 How can you avoid dried out, fried, or messy hair over Spring Break? Did you know that you hair needs as much protection from the sun as your skin does? Dull hair is a sign of damaged hair, just like dull or discolored skin is an indication of unhealthy skin. Each strand of hair is composed of three layers. The outermost, protectie layer is the cuticle. The middle layer is the thickest, containing protein and pigment. The innermost layer is the most fragile. When the outer layer becomes damaged from daily styling, too much sun exposure, or aggressive brushing, the inner layers become susceptible to damage. What happens when the core of your hair strands are vulnerable? Your hair becomes dehydrated, dry, discolored, and dull. Mama, have you noticed that you hair has lost it’s lush luster or patent sheen? Spending a week with beachy hair (aka in direct sunlight at the beach or in the salty sea) isn’t going to help your dried out locks. Side note: swimming in the ocean is bad for you hair but amazing sea salt spray can be nourishing! Read more about the deets here. Hopefully you’re anticipating your Spring Break vacation while also grasping that your hair will need a little extra love during that week. Start prepping your hair for the ocean right now. Your hair naturally produces sebum (oil) as a protective barrier. Although we don’t love oily hair, it is healthy! Reduce ways that you dry out your scalp. Dye your hair less frequently. Use less products on a regular basis (including gel, spray, etc.). Try not to use a blow dryer as often. Give your hair a moisturizing treatment. Try a leave-in conditioner, an apple cider vinegar rinse, or a natural oil. Opt to wash your hair less frequently (no more than every other day) and use a dry shampoo. Try our favorite DIY dry shampoo – make it at home with in 2 minutes by combining equal amounts of cornstarch and cocoa powder! Mama, soak up that luxurious sunshine! Slip into the warm water! Savor the sweet days at the beach with your family. But don’t forget to love on your hair! Wash your hair every night before bed. I know, this is not usually the advice we give since naturally oily hair is healthy hair. However, a special Spring Break trip calls for special requirements. Wash off the salt and damage from the day. Leave your conditioner in a few extra minutes to nourish your hair (which is the perfect time to shave your legs…you want smooth skin while you’re living in your swimsuit!). Use a sea salt spray. Wait, aren’t you supposed to wash off the saltiness of the Spring Break day? So why use a sea salt spray? Keep reading to find out why a sea salt spray is a good option for your Spring Break hair! Sea salt sprays naturally pair with spring break on the beach. But a word of caution: use in moderation! When you massage a sea salt spray into your scalp, you’re promoting blood circulation, which stimulates the hair follicles and therefore allows hair to grow faster. Plus it fights off dandruff and absorbs excess oil. But it’s the salt going to dry out your hair? Yep, it will. Thankfully it’s combined with hydrating ingredients (usually aloe or essential oils). There are a plethora of sea salt sprays on the market. But if you have a few minutes, why not whip up a homemade batch? 3 ingredients: hot water, sea salt, and aloe vera. Additional optional ingredients: leave-in conditioner or essential oils. Let me guess, you have those ingredients already? Awesome! Here’s our DIY all-natural sea salt spray recipe! Use a moderate amount of sea salt spray to style your hair in the morning (hopefully in braids or a cute updo). This will keep you hair in place when the beach gets windy. It will trap moisture to keep your locks from drying out. And it will stimulate hair growth (win). Go about your Spring Break day – swim in the ocean, build a sand castle with your kids, take a walk on the beach with your husband. End your day with a thorough shampoo and extra long conditioning session. Rest up for another day of Spring Break, rinse and repeat!